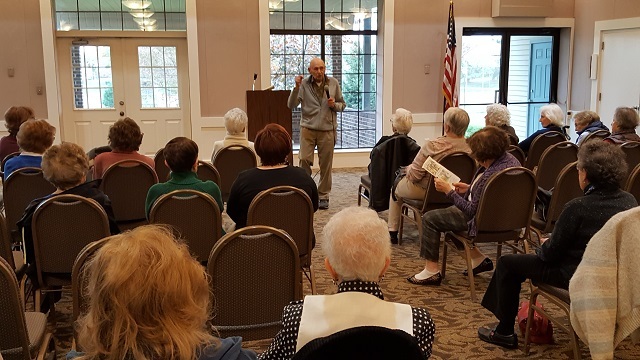 Sy Larson, a resident of the adult community of Greenbriar at Whittingham, spoke today at a meeting held in the Concordia community sponsored by the National Council of Jewish Women. This event was part of a community education and outreach program provided by the Monroe Twp chapter of Indivisible. Sy received his education through the GI bill, earning a PhD in political science. He became a full professor at Rutgers University Department of Labor Studies. Sy has had a distinguished career as an advocate for senior citizens and has served as New Jersey State President of AARP for six years. In his discussion today Sy talked about the issues facing our country that caused the need for a grassroots groups like Indivisible. He spoke of progress by resistant groups and noted the successful efforts to elect progressive candidates evident in Tuesdays results in New Jersey, Virginia and elsewhere. Among the issues Sy addressed were the different health care systems in the United States and discussed the differences between Medicare for all, Universal coverage and Single payer plans. He also touched on the inherent issues of white nationalism, targeting of minorities, and environmental laws favoring companies, not individuals, gun control and the economy. Indivisible Monroe Township is part of a grassroots non-partisan organization, one of 6,000 affiliates nationwide. We promote a progressive agenda, ideals, and effect change through legislative advocacy, education and community outreach.